A rich stew of ox tail, leg or tripe and a variety of vegetables in a sauce flavored and thickened with roasted ground peanuts (peanut butter is just as good!) and toasted rice flour. 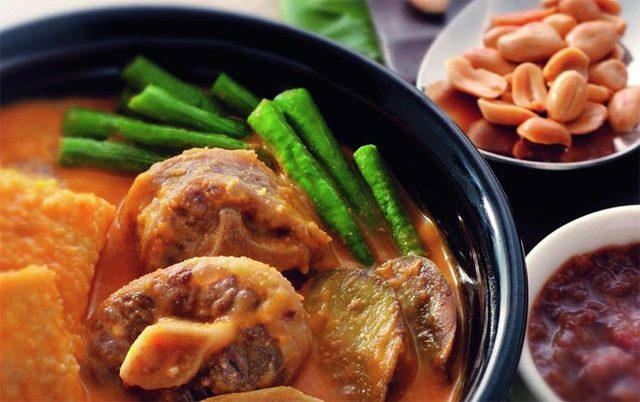 Another way to prepare kare-kare is to cook the vegetables separately in the stock in which the meat has cooked. The cooked vegetables are arranged in the serving bowl with the meat and the peanut sauce is poured in. This is my preferred method because I have better control over the texture of the vegetables to prevent overcooking them. 1 Boil the oxtail in the water for 2 hours or until tender. Drain the meat and set aside. Strain and reserve 4 cups (1 liter) of the stock. 2 Dry-fry the rice power in a skillet over low heat, stirring constantly for 5 to 7 minutes until the powder is lightly browned. Remove from the heat and set aside. 3 Heat the oil in a large saucepan and stir-fry the garlic until golden brown, then stir-fry the onions until translucent. Add the Annatto Water and oxtail to the saucepan and bring to a boil. 4 Add the roasted rice powder, peanuts or peanut butter and reserved stock along with the eggplants, green beans and cabbage, and mix well. Bring the stew to a boil, reduce the heat and simmer for 10 minutes. Season with the salt and pepper. 5 Add the brown sugar and lime juice and stir to mix well. Serve with a small bowl of sautéed fermented baby shrimp (bagoong alamang).